Inception Hosting Review 2019: Is Inception Hosting a Good Hosting? Inception Hosting is a British web hosting company that offers domain registration, shared web hosting, VPS hosting, reseller hosting, and dedicated servers. Their feature-packed plans come with low prices. British hosting company Inception Hosting offers a range of hosting solutions including reseller hosting, shared web hosting, VPS, and dedicated server solutions. This U.K. provider also has a strong presence in the United States, China, France, and India. Inception Hosting’s solutions use Linux, Windows, and BSD operating systems. It has streamlined the setup process with an Instant Activation feature that ensures users can get started as soon as they have purchased their preferred package. The most popular hosting package is the KVM VPS Servers package that comes with 2-8 CPU Cores, 256MB to 32GB RAM, 500GB to 8TB monthly bandwidth, and disk space of between 5GB and 640GB. DDoS protection is offered only to VPS customers within the U.K., but shared hosting customers can enjoy this feature regardless of their location. VPS solutions also use the SolusVM control panel rather than the popular cPanel but shared hosting customers get cPanel. You get daily automatic backups including safe and secure remote backups for peace of mind. Inception Hosting has very cheap hosting plans that come packed with pretty advanced features, and all cPanel-based hosting comes with a free SSL certificate. This provider offers a 99.9% uptime guarantee backed by an impressive compensation plan that gives you a month of free hosting if the availability falls below 99.9%. You also get a 14-day money-back guarantee on all their services except dedicated servers, domain registration, and VPS packages. That is, unless you purchase hosting using a promotional code, in which case you only get a 48-hour money-back guarantee. Oh, I should also say that a 10% administration fee is always deducted from refunds and some customers have complained about not getting refunded at all. 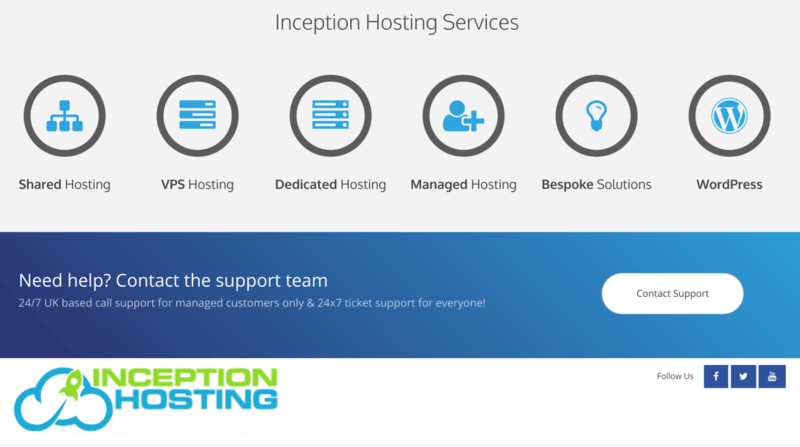 You can contact Inception Hosting’s 24/7 support team via their ticketing system, but managed hosting customers also get telephone support. This vendor is active on social media platforms that serve as communications channels between customers and the company. Sounds good, until I tell you that the support staff can come across as unfriendly and unresponsive. The support pages are available in over 20 languages, but these appear to be automated translations using the Google plugin. The knowledge base is not really worth the paper (or computer screen) it’s written on since it contains just a handful of articles. Inception Hosting has designed an array of web hosting solutions that can be confusing, especially to novice webmasters. However, more advanced users might be excited by the prospect of using the feature-rich and affordable hosting plans. This British business has invested quite heavily in hosting infrastructure with the capacity to host resource-intensive websites from large corporations in the U.K. and beyond. Wondering how Inception Hosting stacks up against other Web Hosting companies? Enter any other Web Hosting company and we will give you a side-by-side comparison.